Film and television are more than entertainment. They inspire, inform and influence our perceptions of other cultures and communities. Last fall, First Nations Development Institute (First Nations) Communications Officer Dr. Sarah Hernandez taught a new course at the University of Colorado at Boulder that examined how cinematic representations of Native Americans impact the public’s knowledge of and interactions with tribes. Twenty-five students participated in the undergraduate film course. On the first day of class, Hernandez asked students to list the three most common stereotypes they’ve heard about Native Americans. The word cloud below captures the students’ responses, which ranged from positive or seemingly innocuous stereotypes, to more negative and potentially dangerous ones. 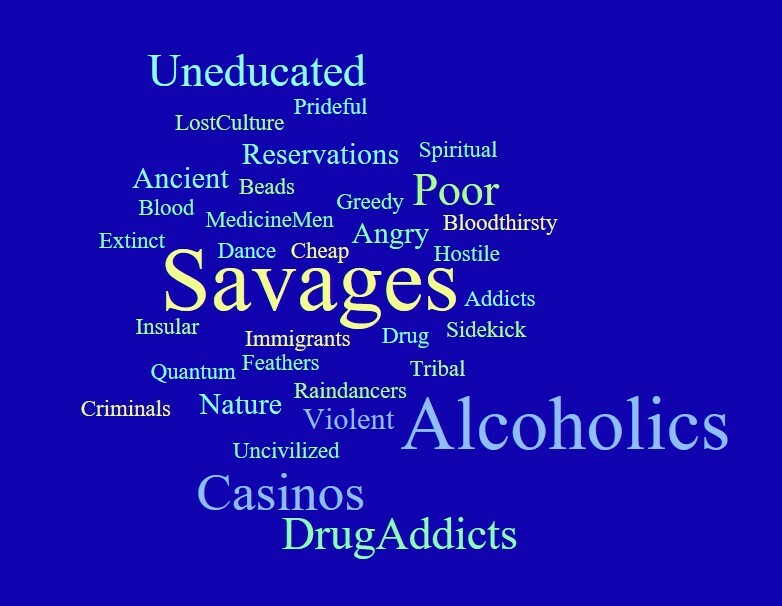 This word cloud indicates that students either viewed Native Americans as ancient spiritual medicine men and rain dancers, or as violent, uneducated alcoholics and drug addicts. Students reported basing these stereotypes on representations they saw reflected in the media. In 2017, First Nations, surveyed more than 3,400 college students to assess their current knowledge of Native Americans. Researchers conducted these surveys as part of the Reclaiming Native Truth (RNT) campaign, a co-led, nationwide research initiative funded by the W.K. Kellogg Foundation and other supporters that aimed to start to dispel America’s myths and misconceptions about tribes. According to these findings, most college students at mainstream academic institutions lack knowledge about or close personal contact with Native Americans. As a result, these students, like most Americans, rely upon flawed resources such as books, television shows and movies for their information about Indigenous people and communities. These representations, whether positive or negative, often paint tribes as static cultural artifacts, as opposed to dynamic political entities. In the course “English 3377: Native Americans and Film,” students watched eight full-length films from the silent film era to the present to examine how Native American stereotypes have changed over time. These films included: Reel Injun (1995), The Searchers (1956), Pocahontas (1995), The Cherokee Word for Water (2013), Bury My Heart at Wounded Knee (2007), Ohiyesa: The Soul of an Indian (2018), Skins (2002), and What Was Ours (2016). Neil Diamond’s Reel Injun provided students with a historical overview of Native Americans in film. This documentary introduced students to several recurring Native American stereotypes, including the noble/ignoble savage, Indian princess, downtrodden squaw, drunken Indian, vanishing Indian, and a deficit model of tribal life. Students used these definitions throughout the rest of the semester to deconstruct images of Native American women and men in film. During the first half of the semester, students considered how highly sexualized representations of Native women as princesses and/or squaws influenced how Native women are perceived and treated by mainstream society. For example, one in three Native women are raped or sexually assaulted during their lifetimes. Class discussion centered on whether there is a correlation between this statistic and the scantily-dressed cartoon character Pocahontas. In the end, these statistics, along with the Powhatan tribe’s lesser-known narrative of Pocahontas, forced several students to re-evaluate one of their favorite Disney princesses. In the second half of the semester, student discussed the male equivalent of the Indian princess and downtrodden squaw: the noble and ignoble savage. The noble savage is primitive, yet wise, and often respectful of nature, while the ignoble savage is violent, blood-thirsty and cruel. Students observed both stereotypes in The Searchers, an early western film that infantilized and vilified Native American men to justify westward expansion, and the theft of Indigenous land. Although students found it easy to identify and condemn overtly racist representations such as those found in old cowboy movies, they often had difficulty detecting more subtle forms of discrimination such as those in more contemporary films. For example, students debated whether HBO’s Bury My Heart at Wounded Knee, a historical drama about the 1890 massacre of 400 Lakota women and children, challenged or reinforced Native American stereotypes. Some students praised the film’s representation of Chief Sitting Bull as a complex, multidimensional representation that defied stereotypes, while others criticized it as offensive and reminiscent of the ignoble savage. In addition to critically examining Native American stereotypes, students also watched several films directed, produced and/or written by Native American filmmakers. These new representations encouraged students to think about this important question: how does the narrative change when Native people start to tell their own stories about their people and communities? For example, students watched and discussed The Cherokee Word for Water, an independent film about Wilma Mankiller, the first female Principal Chief of the Cherokee Nation. Students noted that the film rejected the Indian princess and squaw stereotypes to paint a more empowering representation of Native women that emphasized the important role that Natives and their non-Native allies play in community-building. Students also watched documentaries such as What Was Ours and Ohiyesa: The Soul of an Indian, two recent films that challenged several damaging and pervasive stereotypes about Native Americans, such as the deficit model of tribal life and the myth of the vanishing Indian, which suggest that Native American culture is inferior and rapidly nearing extinction. Instead of reinforcing these stereotypes, these two documentaries promoted representations of Native American culture that highlight the strength and resiliency of contemporary tribes and tribal communities. 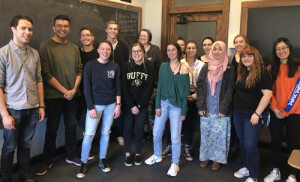 Jordan Dresser (second from left, in green shirt), the producer of “What Was Ours,” visits with students at CU-Boulder and discusses the importance of Native filmmakers controlling their own narratives. Jordan Dresser, who produced and narrated What Was Ours, a PBS documentary about the Northern Arapaho and Shoshones tribes’ efforts to reclaim sacred items stolen from their communities, visited class this semester. During his visit, Dresser discussed the advantages and disadvantages of museums, and the need for mainstream institutions to collaborate further with Native people on projects and decisions that affect their communities. He also underscored the importance of Native Americans controlling their own narratives, and shifting the discussion about Native people and communities. Similarly, when Michael Roberts, First Nations President and CEO, visited class to discuss the RNT campaign, he also discussed the dangers of Native American stereotypes, and reiterated the importance of Native people controlling their own narratives. His presentation emphasized to students that Native American stereotypes have real-life consequences on the people and communities they purport to represent. 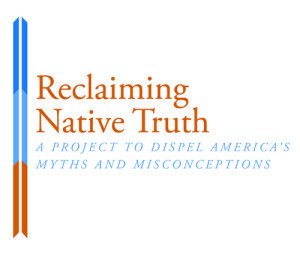 According to RNT’s findings, false assumptions and misperceptions about Native Americans made it difficult for survey participants to empathize with Native people and causes. The Reclaiming Native Truth messaging guide for allies. 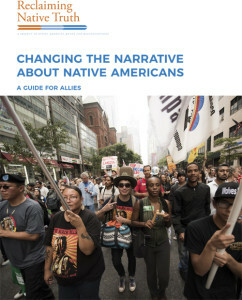 During the last two weeks of class, students read and discussed several RNT reports, including RNT’s guide for how to be an ally, titled Changing the Narrative About Native Americans: A Guide for Allies. RNT researchers developed this resource guide to help non-Natives identify and challenge Native American stereotypes that marginalize, erase and oppress Native people. In addition to helping non-Natives identify these stereotypes, this guide also provide a useful framework that explains how to develop new narratives that empower, rather than disempower, tribes. According to RNT’s findings, the more college students are unaware or in denial of the prejudice, bias and discrimination faced by Native peoples, the less they report supporting Native issues. Colleges and universities are in a powerful position to guide their students, and ensure that these future leader do not perpetuate the same old myths and stereotypes that have disempowered Native people for centuries. This entry was posted in NL09 by rblauvelt. Bookmark the permalink. Your article tells the story of how to reach, to teach truth, in order to shift the narrative about Native America. I agree that these students are the future leaders that can work collaboratively with the Indigenous people of this Nation to change the stereotypes that have too long existed. Your article tells the story of the teaching method you used to teach truth that was effective. It addressed the complexity of stereotypes, but it did not end there. It provided an avenue for collaboration, it was solution orientated. Sarah, tell the story, teach truth, you have a message of great value for Native America as well as White America. Dresser’s statement: “COLLABORATION IS NECESSARY” Your class is a demonstration of what “collaboration” looks like and the positive impact it has on future leaders of this Nation.